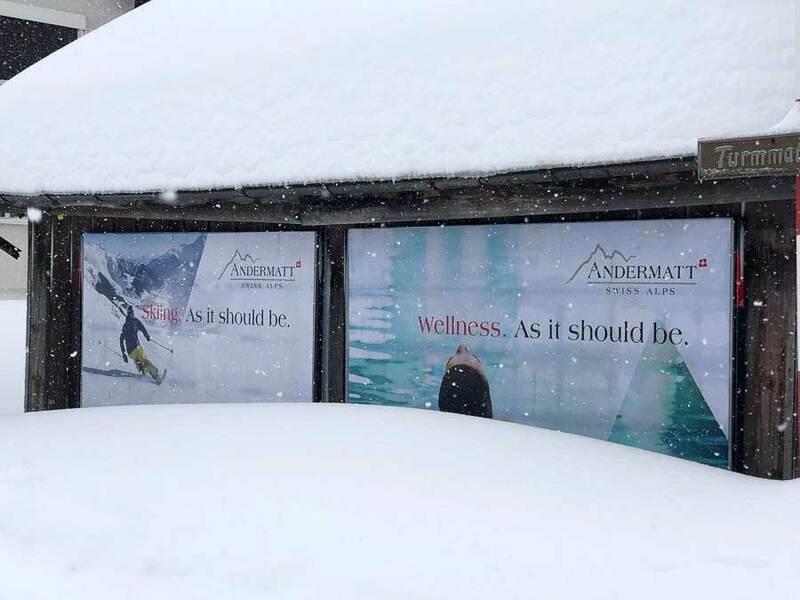 Having read much about the extensive development taking place there over the past few years, and knowing little of the skiing in the area, we took the chance to visit Andermatt last week. 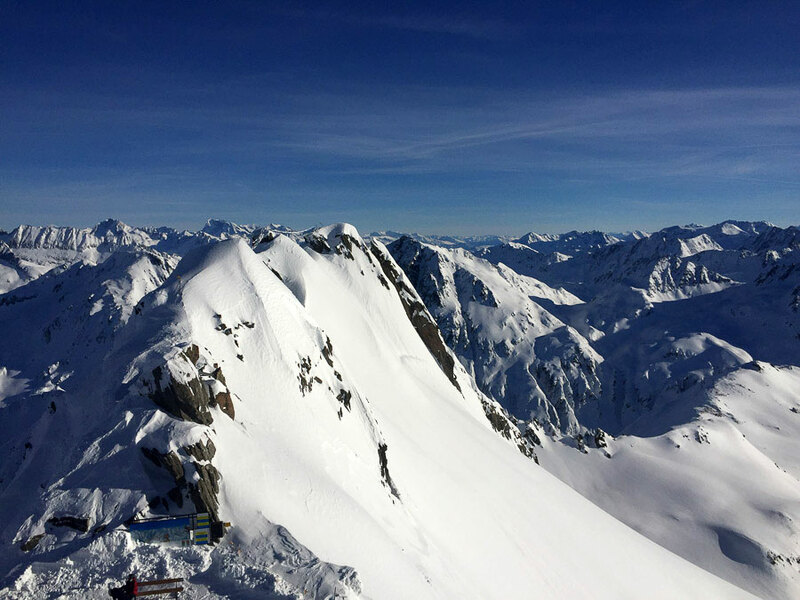 Almost a Billion Swiss Francs has recently been invested in the town and ski area, and almost the same again is planned over the next few years. 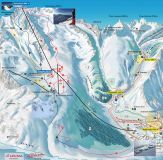 As well as new hotels, including the already-famous Chedi, there are new lifts, extensive snow-making (covering all slopes) and a link to Sedrun via Oberalp. 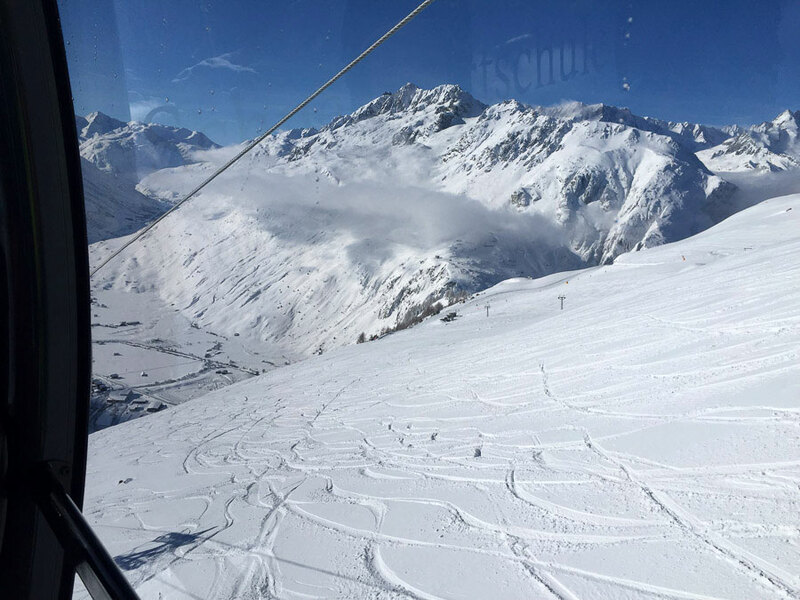 There is more information about Andermatt in our resort pages, so this trip report will focus on the skiing (and we mention the eating!). 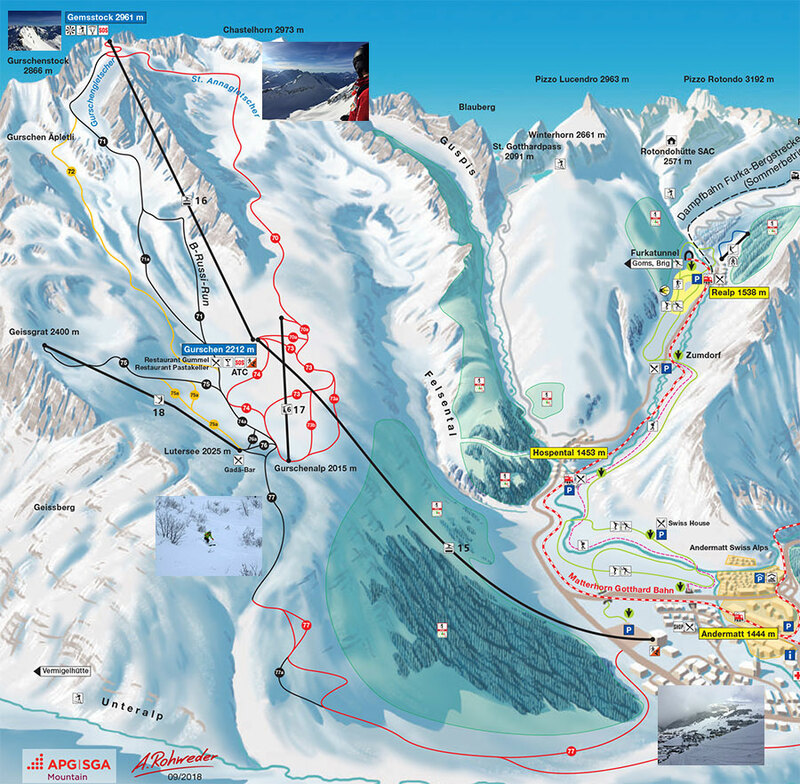 The ski area extends from the 3,000 metre Gemsstock on one side of Andermatt (far left in the plan above), a playground for good piste and freeride skiers, across to a nicely mixed and sunny terrain suitable for all that stretches across several valleys to the lift and train-linked village of Sedrun (and, next winter, Disentis). 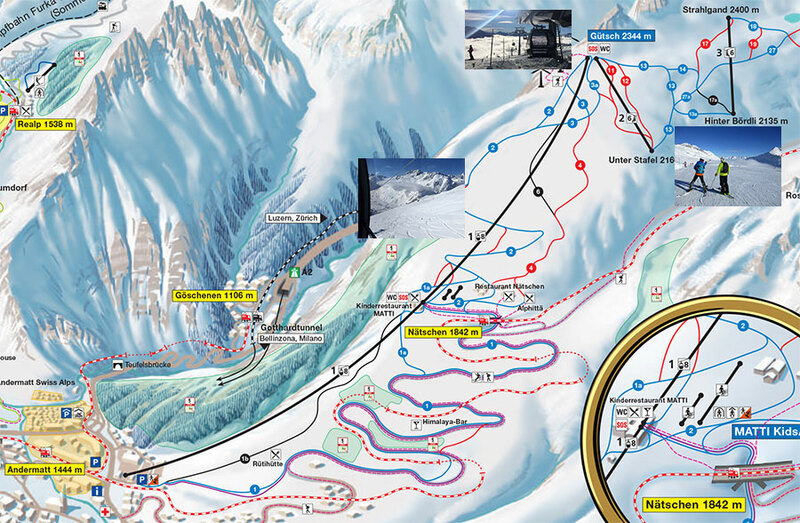 There are over 120 kilometres of piste, accessed by 22 - generally modern - lifts. 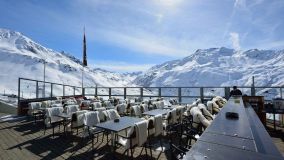 The Matterhorn Gotthard Bahn (railway) line connects all the valley villages and provides an alternative to the lifts in both directions; including - twice a day - the Apres-Ski Train with bar and lounge (and DJ at the weekends)! 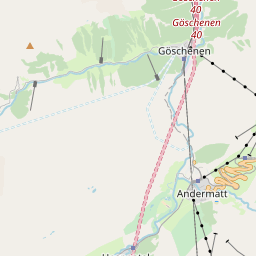 Andermatt to Sedrun (or the reverse) is about 45 minutes. Andermatt can be reached by road and rail, with the nearest major airport being Zurich; normally a train ride (under 2 hours) away. In addition, combined bus and lift passes allow access by bus from a number of towns in the region. Our visit coincided with the tail-end of a huge snow-storm, however, so access to the resort became interesting! 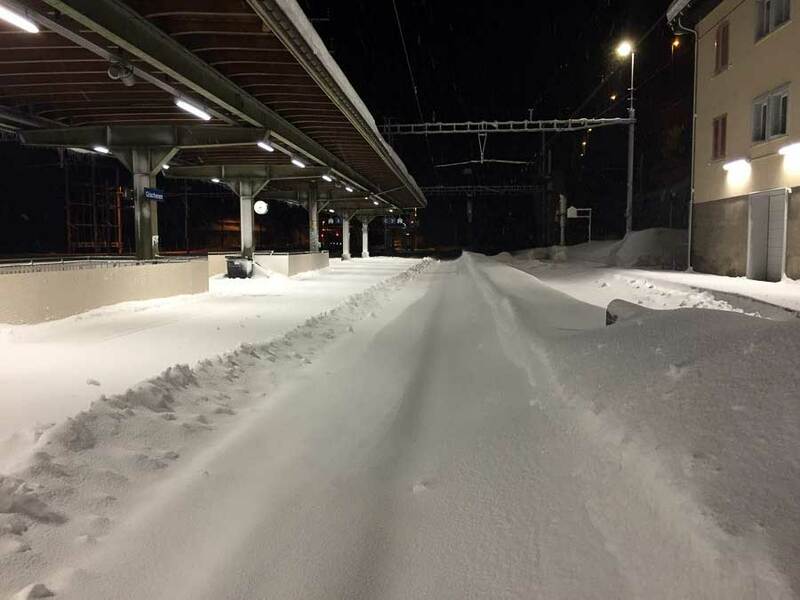 ...but it has a railway station and, even when main rail lines are occasionally and briefly closed (due to avalanche risk) can be accessed by train. ...from where we caught a shuttle train running through the short tunnel into Andermatt. Due to avalanche risk, all the upper lifts remained closed for the day so our skiing was restricted to the lower half of the Gemsstock and runs above the town on the other side of the valley (Nätschen). 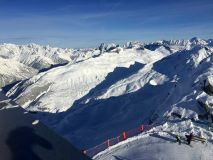 The Gemsstock was very quiet, due to the top gondola being closed but the lower runs had great snow and there was safe, low-angled side-piste with bags of fresh powder to dip into. 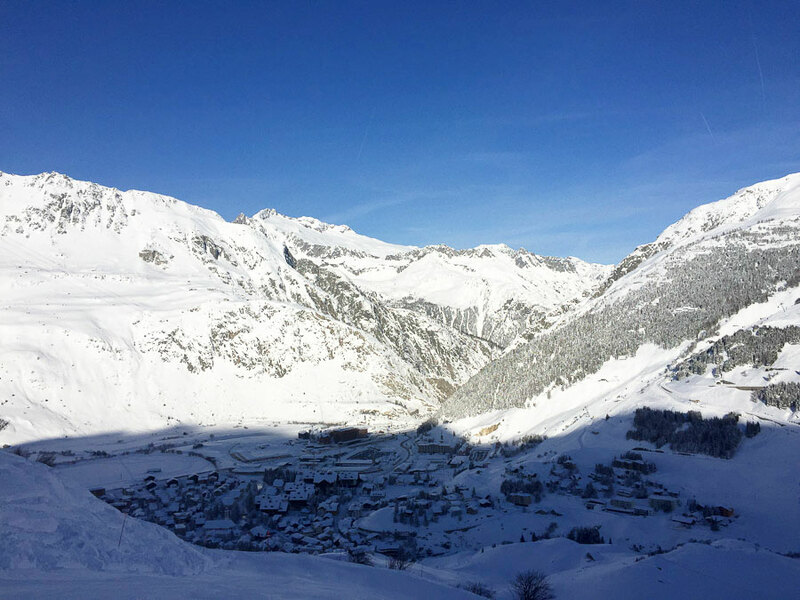 Nätschen is the "sunny side" of the Andermatt valley and most of the few skiers that were out headed here. ...moved to an afternoon above, within and below the cloud! We weren't able to explore further up the valley due to lift closures. "That lift's being dug out... and there's too much snow over there..."
The weekend's snow had now stabilised, bringing the Avalanche Risk Level down to 3 (Considerable) so we took the opportunity to be guided away from the pistes and into the huge and varied terrain of the Gemsstock bowl. 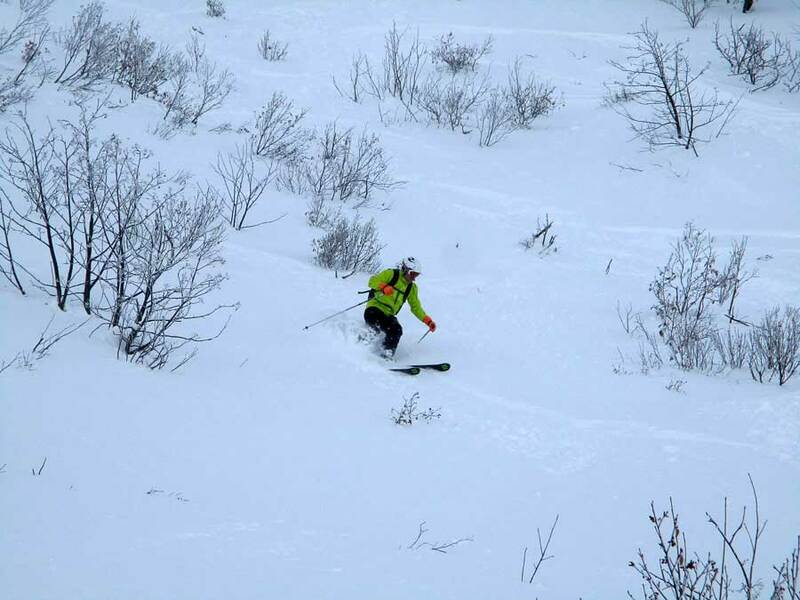 From a couple of well-used entry points off the piste, traversing skier's right gives access to a whole range of different ridges and pitches and we barely scratched the surface in a series of descents through creamy powder - seeing few other skiers even though the day was a popular one! Exiting the bowl can take you back up via a chair (skier's left) or T-bar (skier's right) or you can drop toward the town by piste and the mellow pitches we skied the previous day. 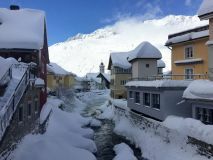 Andermatt, and the area in general, prides itself on the quality of the food and our experience certainly bore that out; from the "simple" soup and burgers on the mountain to both traditional and innovative evening dinner, everything we ate was excellent. Eight restaurants operate under the brand "Mountain Food" and emphasise local produce... even down to the water (Berg Wasser)! There are a number of new 4 and 5-star Hotels, in addition to the existing hotels in the old town. We stayed at the Radisson Blu Reussen which was excellent; with super-friendly and efficient staff, high quality furnishings, very comfortable rooms and great food. 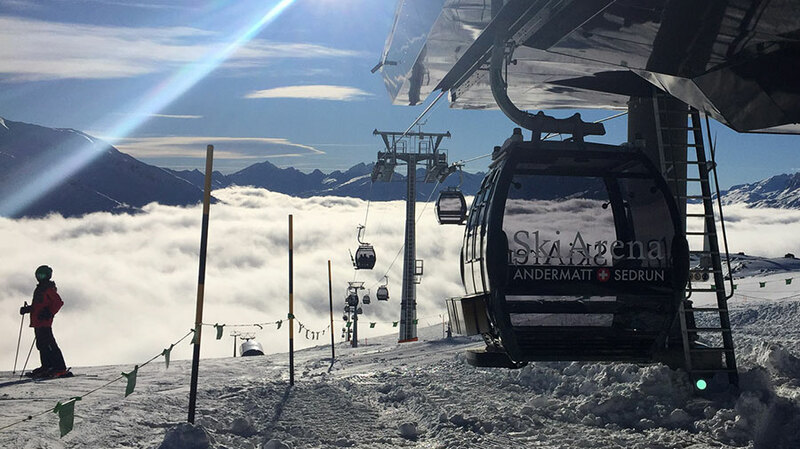 Andermatt, although not the largest of ski areas, genuinely offers something for just about everyone. From freeride on the Gemsstock to children's areas on the sunny side. 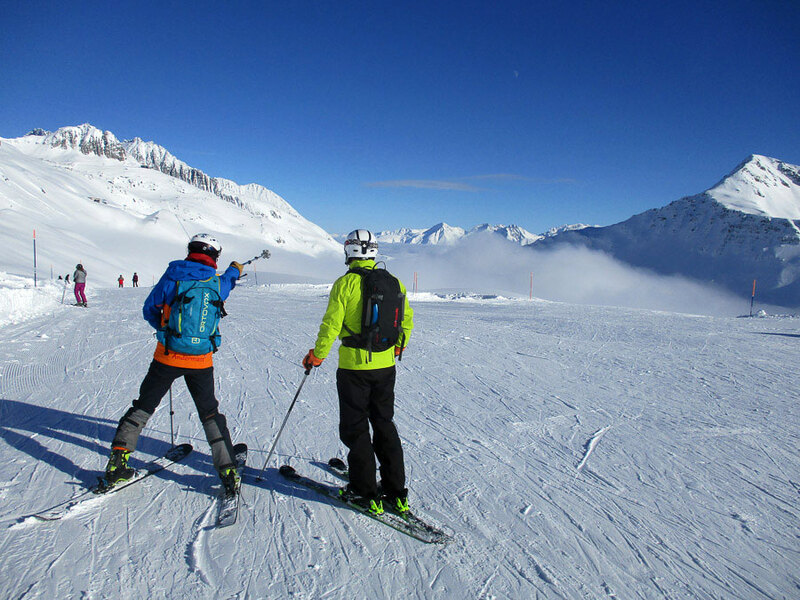 Although we weren't able to try it for ourselves on this trip, the journey across the valleys to Sedrun (and maybe back by apres-ski train) looks fun for those who like to travel. 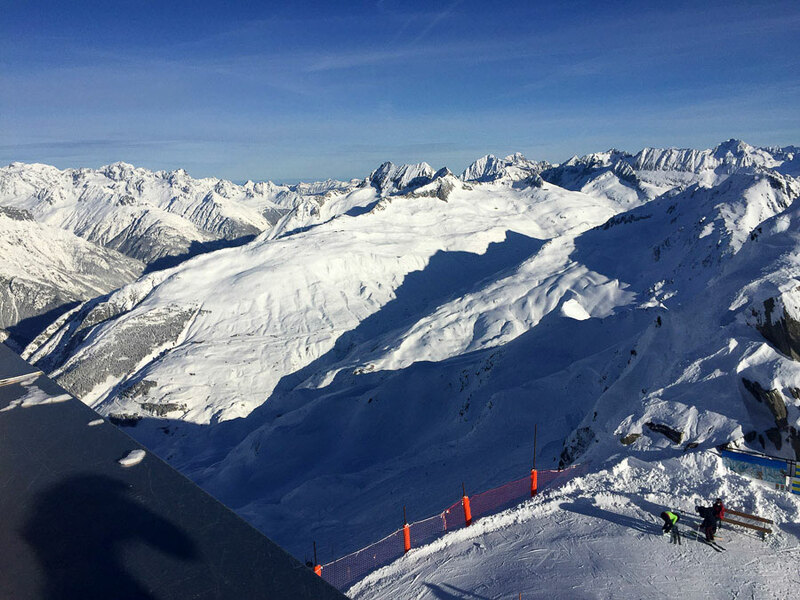 The local focus on quality of food, service and skiing was inescapable and we thoroughly enjoyed the trip. Looks like some pretty good offpiste to have a go at there. Great that you can reach there on train also. 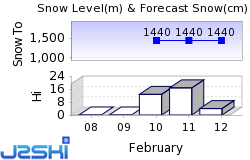 Definitely one of the big pluses of Swiss skiing. Ranchero_1979 wrote: Looks like some pretty good offpiste to have a go at there. Definitely. 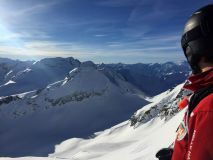 I'd like to go back and do more of it... and the views really are special (even by the standards of the Swiss Alps) when you want to stop and stare! On my bucket list too and I echo the comments about the train access; most welcome for those of us who like to do our own thing away from tour operators but don't want to hire a motor car.